Why you want to train your child to obey you rather than just memorize rules of what is okay to do and what is not okay to do. 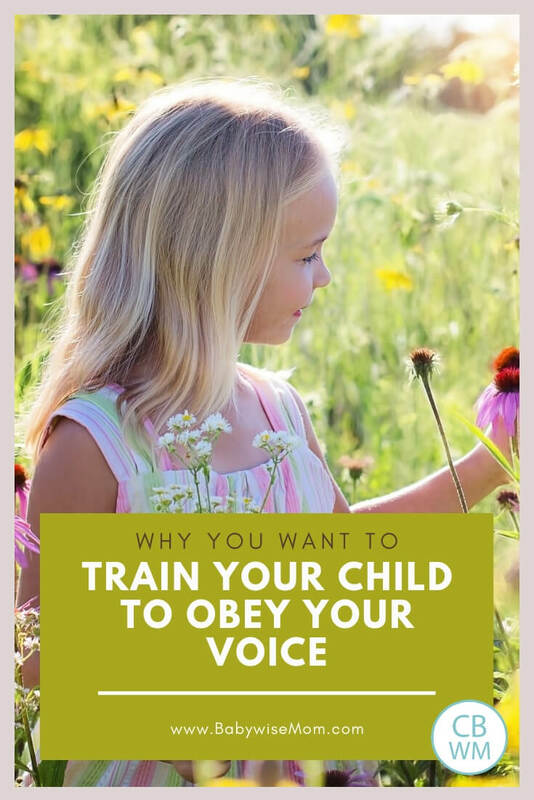 “The goal is to train the child to obey your voice (which includes tone and modulation), not to the object” (On Becoming Babywise II, page 95). This is very important to remember when training your child. You are not seeking to train your child to memorize a list of objects that are okay and objects that are not okay. You are seeking to train your child to listen to you and obey you when you tell him to do something or to not do something. As Babywise II points out, you are the constant. The object is the variable. If your focus is on objects, then your child might end up being well trained at home, but when you go out, he could be a difficulty. That is, unless the places you go to have the exact same objects that are nos in your home with nothing added. Yes, your child will get to the point where he knows what is and isn’t okay at home. He will ignore the nos. That isn’t a problem. You just want to be sure that your child obeys you. When you are in a new situation, you want him to listen to your voice. You will encounter new nos at the park, the store, your friend’s house, on a walk, etc. This is further reason your solution in life is not to “baby-proof” your entire house. Remember, you take care of safety needs, but you don’t remove everything from your child’s reach in order to avoid conflict with the child (see Baby-Proofing ). 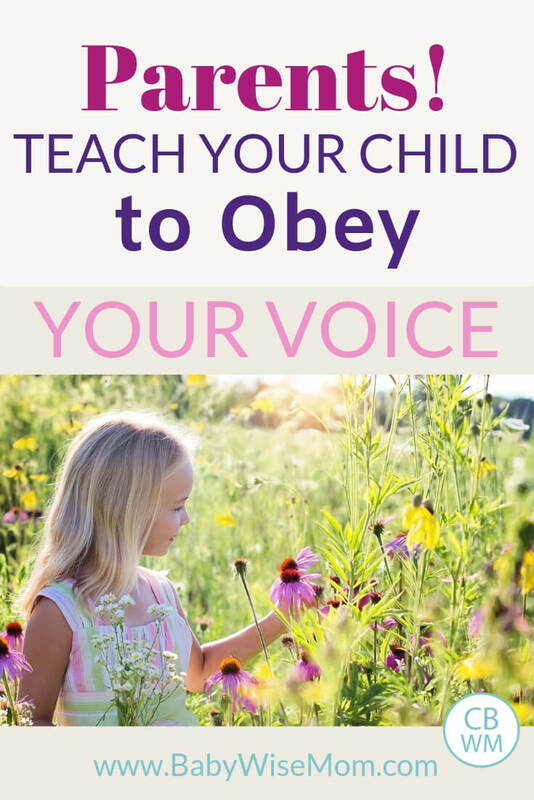 You want your child to learn to obey you. It takes time. It takes effort. It takes consistency. But once your child obeys you, you will have no problem taking him shopping with you. You will have no problem taking him to the park while you have your newborn in tow. You will be able to enjoy your child and parent with confidence. Yes, there will be rough days. I remember one day when Kaitlyn was a few weeks old. We went to the park. When it was time to go, Brayden did not want to leave. He cried. Kaitlyn cried while I was trying to round him up. I wondered what on earth I was doing at the park. Brayden was very, very obedient. But even obedient children have moments they do not listen or obey. The hard days will come, but you will have far more good days than bad, and you will be able to take the bad in stride. When you teach your child to obey and listen to you, your child will transfer that obedience to other authority figures in life. The child who is required to listen to mom at home is more likely to listen to teacher at school. The child who follows instructions at home will follow instructions at soccer practice. 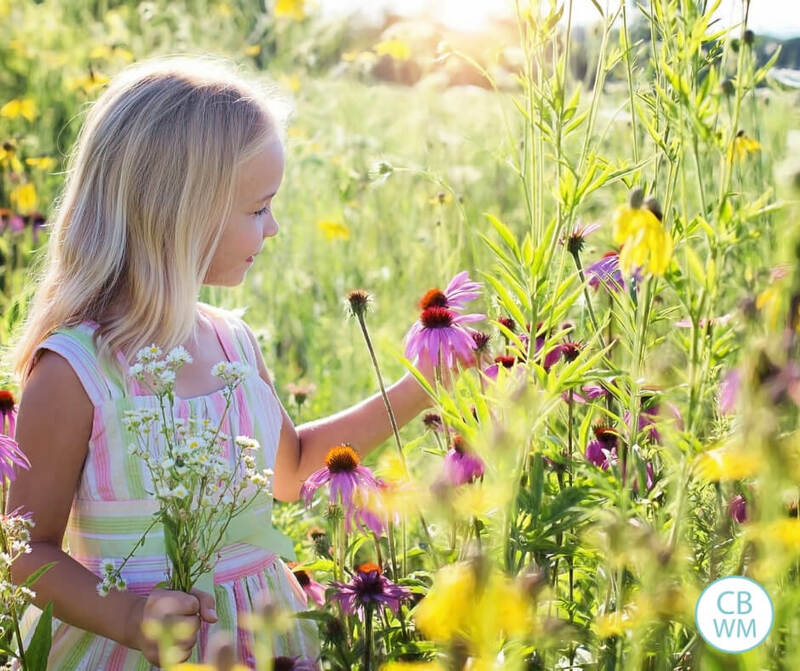 Not only are you setting yourself up to have positive experiences with your child, you are setting everyone else up to have positive experiences with your child. All children will disobey at times. Do not expect perfection. You can, however, expect a lot. A huge help to having your child obey well is to start young. You can start discipline foundations with your baby. You can give your toddler boundaries. No matter what age your child is, start your foundation now. Starting now, whenever now is, is always better than later. Always remember that it is easier to train and teach your child in times of non-conflict. Teach your child to obey, why to obey, what is okay, and what isn’t okay when your child is not testing boundaries. Then you have consequences in the times when your child is testing boundaries. I’m not sure, but in the 2nd paragraph, did you mean, “You are NOT seeking to train your child to memorize a list of objects…” That seems to fit better with the rest of your post, as there are even times when certain objects are okay at one point but not okay at another. I want him to obey my voice and my instruction at any time, not ignore me because he knows that a particular object is okay for him to touch/play with.Thanks for this post! It’s a good reminder to continue working with our little ones, even during those discouraging days where it seems they want to ignore you! Consistency does pay off! I was wondering the same thing, and I’m pretty sure that’s what she meant! It goes along with the rest of her post, and with BW2. Just curious… what do you do when your toddler throws a tantrum when he doesn’t want to leave somewhere fun? How do you (or did you)teach him to come nicely? Also, how do you teach them to obey your voice. I’m really struggling with this right now. My toddler is seriously defiant (it feels that way anyway). When I tell him something, he tells me “no.” I’ve explained not to tell me no, but I’m at a loss for how to get past this. Is it just a stage? Do you have any advice? Young Family & Jamie, Um…yeah, that is what I meant 🙂 Thanks for pointing it out to me! Kristin,That happens. I am sure every toddler sometime throws a fit when not wanting to leave a fun place.You have to consider age on your exact reaction. First, make sure you give your child warning before announcing it is time to go. “In two minutes, it will be time to go home. Say yes Mommy.” If your child is old enough, you can talk to him beforehand. “We are going to the park right now. When it is time to go home, I want you to leave happily without having a fit. If you throw a fit, we won’t be able to go next week. Say yes Mommy.” But then the fit happens. I would remove the child. If he doesn’t want to walk, you carry him. You need to remain calm and unemotional. You tell him you understand he is disappointed and you know he wants to stay and play, but it is time to leave. You then need to enforce whatever consequence you told the child would happen next time. With training for voice, mostly it takes time and consistency. It is a stage in that it is normal for children to tell parents no, but it isn’t a stage in that he will “outgrow” it some day. He needs to be taught. Take priviledges away based on the situation and what is important to him. If you tell him it is time for nap and he tells you no and won’t go, then he might lose the priviledge of walking to his room himself; you would carry him instead. We are having a problem right now and I'm not sure what to do.Scooter loves to play chase. Dad has played it tons of times and now anytime anyone walks in Scooters direction-he thinks its a game. Even at the park-he walks up to kids and then runs away, hoping they will chase him.I have tried my best to teach him to listen to my voice, and when he is going to do something wrong-all I usually have to do is use a few words and he listens.BUT, when it comes to asking him to "come here" we are not successful at all. He is learning to walk by holding our hand, and when situations permit it, we let him walk around by himself. But then when it is time to have him come back and walk with me or leave or whatever, he hides. I haven't found a way to teach him to come to me when I ask. I don't then want to go chase him down to pick him up because he laughs and squeals and doesn't understand the difference.I have told dad since that "chase" is not appropriate since it is affecting this learning lesson, but when scooter is with other kids, they don't understand that I don't want them to chase him.And what are the consequences of not coming to me. Again, I have to go chase him if I'm by myself. If I pick him up and take him with me, then thats nothing new either-thats not a real consequence, he just thinks I "got him. "Do you remember if this was something that just happened or what did you do to work on it? And is (age appropriate at 15 months) very good at first time obedience in everything but "come here," so its not a consistent problem-I worked very hard on getting him to listen to my voice-so it isn't a memorized list in his head. Lorri,I think this is just going to be a thing that requires time, practice, and patience. This sounds like childishness (see post childishness vs. foolishness). He is young and has had fun playing "tag." I would say, "Scooter, come to Mama." if he smiles and runs, say, "No, Scooter, it isn't time for games. It is time to come to Mama." If he doesn't come, go get him and say "this is coming to Mama." Keep at it for a couple of weeks and evaluate from there.